» BAYHORSE SILVER MAIDEN RESOURCE 6 MILLION OUNCE, NI-43-101 INFERRED, BAYHORSE SILVER MINE, OREGON, USA. BAYHORSE SILVER MAIDEN RESOURCE 6 MILLION OUNCE, NI-43-101 INFERRED, BAYHORSE SILVER MINE, OREGON, USA. Bayhorse Silver Inc, (The “Company” or “Bayhorse”) TSX-V: BHS is pleased to announce the release of a Maiden Inferred Mineral Resource for the 100% controlled Bayhorse Silver Mine, Oregon, USA. The maiden resource is comprised of 292,300 short tons at an average grade of 21.65 troy ounces per ton (opt) silver (Ag) for total contained silver of 6,328,400 ounces. The mineralized material contains significant amounts of copper (Cu) and zinc (Zn), however the historic data utilized in the mineral resource estimate did not allow for a reliable calculation of the grade of Cu and Zn. •	292,300 tons inferred mineral resource (See Table 1 below). •	21.65 opt Ag grade (See Table 1 below). •	6,328,400 oz of contained silver (See Table 1 below). •	Mineralized silver zone hosted in rhyolite with dimensions approximately 800 ft (245 m) along strike east-west, 200 ft (60 m) across strike and 23 ft (7 m) in thickness. •	An additional conceptual exploration target of 200,000 to 250,000 tons at a range of grades of 10 to 20 opt Ag for a range of 2 million to 5 million ounces of silver has been modelled. •	The additional exploration target is conceptual in nature, there has been insufficient exploration to define a mineral resource for the exploration target and it is uncertain if further exploration will result in the definition of additional resources. APEX Geoscience Ltd. (APEX) of Edmonton, Alberta has provided the Inferred Mineral Resource Estimate in Table 1 below that is primarily based upon historic underground channel sampling and drilling, supported and confirmed by recent underground sampling by APEX and Bayhorse personnel. A total of 364 channel or drillhole samples have been used in the estimate. Silver grades for composites have been capped at 135 opt, which resulted in the capping of seven composites. The resource was calculated using inverse distance squared (ID2) and all blocks intersecting the known and modelled underground workings were removed. 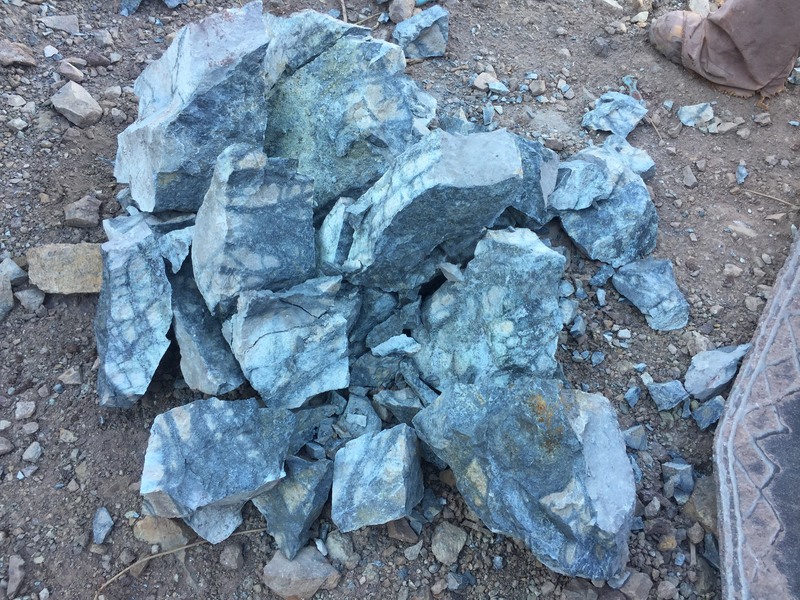 At a lower cut-off grade of 7.5 opt Ag, the mineralized material removed from the resource was approximately 20,700 tons at an average grade of 24.34 opt Ag for a total of 503,000 ounces of contained Ag. Based upon historic reports of mining, this is in line with what has thought to have been removed historically. The Bayhorse Silver Mine is reported to have produced at an average grade of 35 opt Ag in the 1920’s, and the last time it was mined in 1984, the grades averaged 16.7 opt Ag. Table 1: Bayhorse Inferred Mineral Resource Estimate for silver at a variety of lower cut-off grades. The current mineral resource is bolded. * Inferred mineral resources are not mineral reserves. Mineral resources, which are not mineral reserves, do not have demonstrated economic viability. There has been insufficient exploration to allow for the classification of the inferred resources tabulated above as an indicated or measured mineral resource, however, it is reasonably expected that the majority of the inferred mineral resources could be upgraded to indicated mineral resources with continued exploration. There is no guarantee that any part of the mineral resources discussed herein will be converted into a mineral reserve in the future. The estimate of Mineral Resources may be materially affected by environmental, permitting, legal, marketing, or other relevant issues. The Mineral Resources have been classified according to the CIM Definition Standards for Mineral Resources and Mineral Reserves (May 2014). **A price of $US15/oz Ag with a conceptual underground mining and processing cost of $100US/ton has been utilized to derive the favoured lower cut-off for Ag of 7.5 opt. ***Grade in ppm and contained ounces may not add due to rounding. The Company is not basing any decision to produce silver and other metals on a feasibility study of mineral reserves demonstrating economic and technical viability and also advises there is increased uncertainty and specific economic and technical risks of failure with any production decision. These risks include drop in price of commodities produced, namely silver, copper, lead, and zinc, from the pricing used to make the production decision, failure of the grades of the produced material to fall within the parameters used to make the production decision, and increase in mining costs due to changes within the mine during development and mining procedures. There are also metallurgical recovery changes that cannot be anticipated at the time of production. APEX has estimated a remnant maiden inferred mineral resource for the historic Bayhorse Silver Mine utilizing a total of 364 underground channel and drillhole samples including 20 underground drillholes that have intersected or bracket mineralization. Modeled 3D geologic ‘solids’ were used to constrain mineralization in the block model and grades for silver were interpolated into blocks by Inverse Distance Squared (ID2). The Bayhorse Silver mineralized zone is hosted within a rhyolite that is structurally controlled along a modest dipping thrust fault. Geological 3D solids were developed using cross-sections and level plans in conjunction with modern surveys to constrain the mineralization at the historic Bayhorse Silver Mine. East and west domains were created to accommodate elevation differences in the mineralization. In both cases a rough cutoff value of about 2 opt Ag was used to define and wireframe the 3D solids. Based upon statistical treatment of the silver data for each of the two mineralized domains capping was employed at 135 opt Ag but had little effect on the overall estimate. A 2.0 m composite length was selected to approximate a potential underground mining height for the Bayhorse mineralized zone. In both zones, uniform down-hole composites were formed honoring the domain boundaries. Variography on the composite data was used to model prominent search directions for silver in the two domains. Silver was modeled along strike (Azimuth 099° Plunge -1° to the north), dip (Azimuth 189° Dip -18°) and across dip (Azimuth 186° Dip 72°). Separate block models were completed for each of the two remnant domains and the mined out areas within those domains. The block model was dimensioned at 4 x 4 x 4 m with sub-blocking down to 1 x 1 x 1 m in order to fit to the mineralization solids for the Bayhorse mineralized zone. Based on available data the historic underground workings at the historic Bayhorse Mine were block modelled separately within the mineralized zone and were not included in the mineral resource estimate. Specific gravity measurements were done on recent sample pulps by ALS Chemex and American Assay Laboratories based upon Archimedes methodology and resulted in 29 measurements for mineralization of different grades within the Bayhorse mineralized zone. Based upon this data blocks within the Bayhorse mineralized zone were assigned an average specific gravity of 2.80 g/cm3. Grades for silver were interpolated into blocks by ID2 using the search ellipsoid dimensions and orientation established by variography. For the Bayhorse block models, the grade interpolation was completed in a series of passes with expanding search ellipsoids. As a verification tool for the selected ID2 block model, the composite average grades, the ID2 block model average grade and an average grade of an OK (ordinary Kriging) block model were compared along 20 m windows east – west, north – south and 5 m windows with elevation. Block grades matched the composite grades relatively well with no significant bias indicated in any of the modelled domains. No economic evaluations have been completed on the Bayhorse mineralized zone, and as a result an economic cut-off for the mineralized zone is unknown. However, for the purposes of reporting mineral resources on the Project, current silver metal prices and current US$-CDN$ exchange rate were reviewed. In addition, a number of small operating mines were surveyed and reviewed for their existing operating costs for mining and processing. It was found that a lower silver cut-off grade corresponding to 7.5 opt Ag should be adequate for the mineral resource estimation and satisfy reasonable prospects for eventual future extraction. The Ag grade was determined for each estimated block utilizing a price for silver of US$15/oz. and 90% recovery. Conceptual mining and processing costs were estimated at $US100 per ton of mineralized material for the purposes of establishing the lower cut-off grade for the mineral resource. A National Instrument (NI) 43-101 Technical Report summarizing the Bayhorse Project and the Inferred Mineral Resource Estimate will be provided within 45 days of this News Release. The Company has granted 1.9 million incentive stock options, exercisable at fifteen ($0.15) for a period five years, to officers, directors, consultants and employees of the Company.